To see the greatest elasped times for southern African weavers, see here. This species is harder to catch than most weavers, and thus the longevity record was a mere 4 years (ring 5H17931). On 21 Oct 2006 Frik du Plooy ringed a Red-billed Buffalo-weaver at Wolfhuiskraal Farm, north of Pretoria, South Africa, as an adult female. Nine years later Renette Opperman observed a Pearl-spotted Owlet that killed this weaver at Wolfhuiskraal. The new longevity record for this weaver is 9y 9m 25d (ring D55851). The previous longevity record for this species was 10 years (ring 4H16349, see news here), for an adult female. 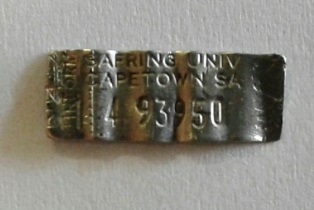 On 18 Sept 1995 Susan Schoeman ringed a Thick-billed Weaver in Lydenburg, South Africa. The bird was sexed as an adult female but with mass 49g, indicating that it should have been listed as a male (and presumably an immature male, else it would have been listed as an adult male). Brian Jones found this bird dead 21 years later, near the aviary at the Moholoholo rehab centre, 76kms from the ringing site. A photo of the bird and ring were sent to SAFRING, confirming that the ring number was not misread. 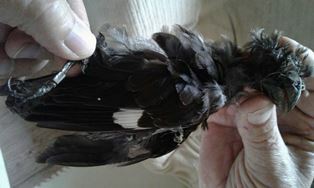 The photo also shows that the bird was an adult male. The new longevity record for this weaver is 21y 6m 2d (ring 493950). This is a new world record for any weaver in the wild, increasing the previous record by several years (16.5 years for a Seychelles Fody). There are several records of weavers exceeding 20 years in captivity.